Andrea Hubbard is a former farmworker who now helps women protect themselves from pesticide exposure and domestic abuse. This is a first in a weekly series of personal stories from farm and agricultural workers, illustrating the need for stronger worker and safety protections against pesticide exposure. To get beyond the statistics of 10,000–20,000 pesticide poisonings on farms a year in this country, we go to the frontlines, beginning in California. My name is Andrea Cabrera Hubbard. I started working in the fields as a child, picking squash for half the day and then going to school the other half. At school, my classmates would bully me for working in the fields. I made it to fourth grade and then quit. After that, I worked all day, every day, cutting tomatoes in Mexico. Sometimes the tomato cans were heavier than I was and sometimes we would work 14 to 16 hours a day. In 2001, I came to the United States and began to work in the fields here in Santa Paula, California. I had a lot of fear and didn’t want to come here, because before I arrived, I had heard that this is the land of the slaves. Today, I don’t work in the fields anymore, and I am studying English. I’m united with the organization Lideres Campesinas to help other women so they don’t have to live the life I had to live. Working in the fields, there’s a lot of abuse. The bosses, foremen and supervisors are the most abusive to the workers. I think most field workers would share their stories but because of the fear, nobody speaks up. The laborers think they are going to be deported, so they would rather keep silent and hold back the pain from all the chemicals they use. One Sunday while I was cutting strawberries, the boss was fumigating right beside us, spraying us with chemicals. A lot of people started throwing up. We asked, “Why are you doing that?” And he said, “It is just water with soap. Why are you guys complaining?” When I said something, he fired me. They don’t let us talk. That’s why people are fearful to say something. 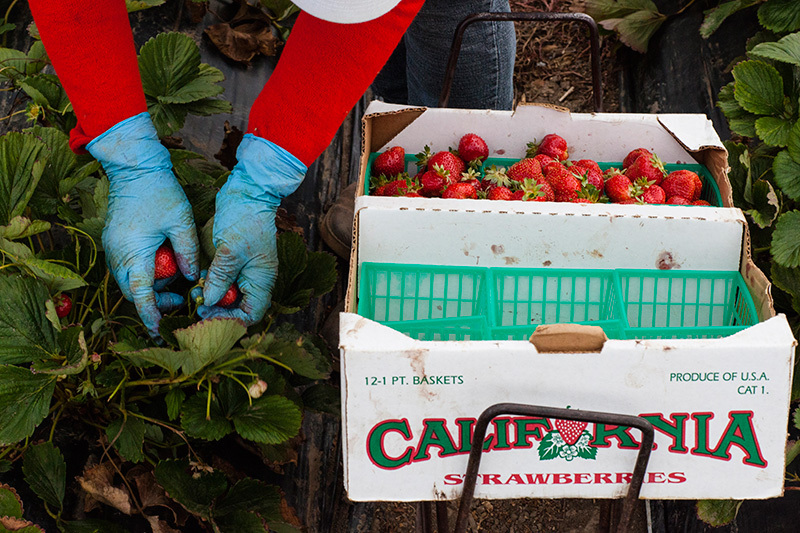 Strawberries are packed by farmworkers in a California field. Many people here in the U.S. think that we are here to steal their jobs. But they are not willing to work in the fields, which requires bending down for hours to cut the strawberries and running after the boxes while keeping up with the tractor to fill, when you get paid $1.25 a box. The work goes on whether it is pouring rain or 105° heat. Who else is going to work that hard for those low wages? Without us, Americans would not have their cheap food. Andrea’s story is one of a series that highlight the changes that need to be made to the WPS.